There is nothing quite as luxurious when it comes to conservatories as the P-shaped conservatory. Available to homeowners in Fleet, Hampshire, Farnham, Camberley, Aldershot, Basingstoke, Hook, parts of Berkshire, Farnborough, Bagshot, Surrey, Lightwater, Cove, Frimley, Yateley and surrounding areas, these grandiose conservatories make a real statement when it comes to home improvements. Contact us for more information. When you have extensive space available to you, then the P-shaped conservatory is the ideal choice for your Fleet, Hampshire, Farnham, Camberley, Aldershot, Basingstoke, Hook, Farnborough, Bagshot, Lightwater, Cove, Frimley and Yateley home. They offer an outstanding level of luxury living space, that can be used for any purpose at all, or even, due to the size, be multipurpose. The P-shaped conservatory from Ultraframe is created using a combination of the lean-to conservatory and the Victorian conservatory. It is this union that enables it to spread to the entire width of your home and to make a real feature that you can take pleasure in for many years ahead. It is the perfect choice for when you have extensive space available. 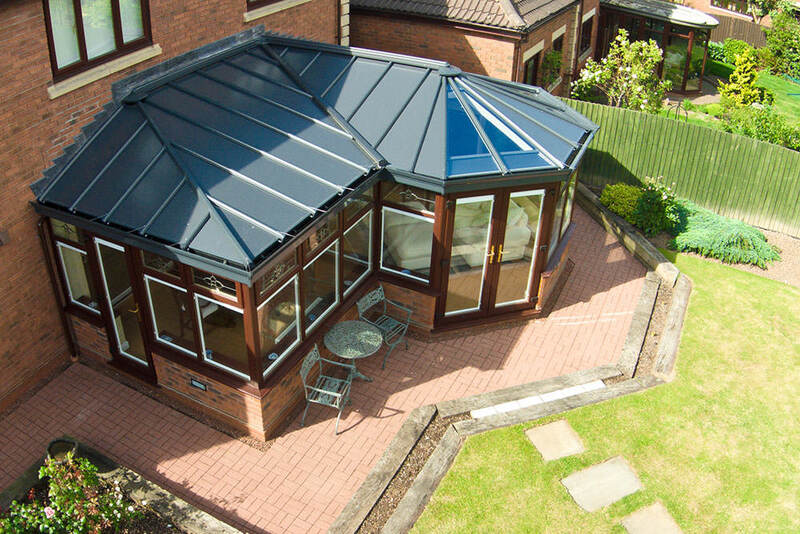 It enables you to truly enhance your home and garden, adding value to your property with a lifestyle conservatory. The final design will be unique to you and the space you have available, and you can customise it further with a wide range of colour choices and glazing options. The final installation will be a truly unique extended living space! You can choose to have your P-shaped conservatory constructed from either uPVC, aluminium or timber, so whatever look you wish to achieve, we can help create it with you. Just discuss your ideas with us when we come to view the space available, and we will create a magnificent P-shaped conservatory design that meets your requirements. Our P-shaped conservatories use all of the cutting edge techniques and state of the art materials that all our double glazing products rely on. This means that your conservatory will provide outstanding efficiency. Heat loss will be minimised, there will be no draughts and the weather will be kept outside. Our P-shaped conservatories come with high security multipoint locking mechanisms as standard. These exceptional locking systems are top quality, and will make it almost impossible for anyone to break into your conservatory. Your home will be safe and secure when you have a P-shaped conservatory from us. We know just how great our P-shaped conservatories are, and how incredibly long lasting and high quality they are, but we want you to have that confidence too. We provide a 10 year fully insured guarantee to all our homeowners at the point of the double glazing installation. You can be sure that your P-shaped conservatory will last the test of time. Visit our online quote calculator, or contact us, for a free quote that is tailored to your specifications. We are happy to discuss your options with you and come out for a home visit, so that you can make a fully informed decision on your new P-shaped conservatory. There’s no obligations attached to any of our quoting services, so speak to us now!